"your life is an occasion, Stand up to it"
Yea, I think you confirmed what I was thinking Joe - cheers. 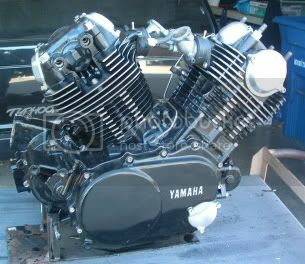 I'm aiming for something like this [ courtesy Turbodog ] but using satin Black with barrel and head fins filed. 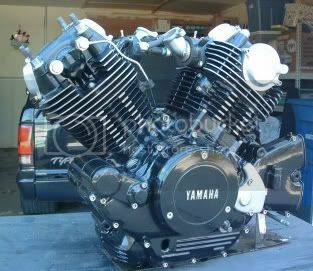 It's the Yamaha script I want to lose - probably be replaced with a "Vindicator" logo. BC...bog will crack as will epoxy. Weld is the only permanent solution. Cant speak personally for Yamaha...but the metal they use cant be any worse than Honda's and it welds just fine. Thanx Rev - that's the info. I wanted. I'm only going to do this once [ well twice actually - 2 bikes to build ] !! I was just a bit concerned about the quality of the alloy castings. I've got nothing against the Yamaha name - but for a 60's inspired Cafe Racer that does scream out a bit ! i've been waiting for new piston rings so i got "ballsy" and notched out the fins. it came out awesome. it took about 3 hours. used a small machinist file and a dremel with a ball shaped bur bit. full engine pics will be up soon. Guiness has a new "Black Lager" out. It's the consumption of excess alchohol that has been the starting point for MANY projects over the years ! Mmmmmmmm, going to have to check that out. that looks baller man! really dig it! That one is a CL175 sloper more or less stock with minor modifications. Small can be beautiful too. Those are 26mm Keihin carbs and under the alternator cover is a single Dyna trigger on a shortened crank nose and it still whips. Stock crank, lightened rockers, modified pistons, lightened valves, light tappet adjuster screws, Megacycle street cam. Now makes around 21hp @ just over 11k and stock it made around 11hp at the rear wheel and we thought it ran pretty well at that.